Have you ever wondered what magical process is used to remove the caffeine from coffee to make decaf? Well, wonder no more. Plus you might be surprised to learn that not all decaf is created equal. For most people, caffeine is an essential part of coffee, but for others sensitive to caffeine, it’s is not always welcomed in our cup of coffee. Started in Switzerland in the early 20th century “Decaffeination” is the process of removing most of the caffeine in coffee. Experiencing a delicious cup of joe without the stimulating effects of caffeine is possible thanks to the most common decaffeination methods of: Water Process, CO2 extraction and Solvent Process. Regardless of the process used, the goal of decaffeination is to remove the most caffeine possible while not affecting the overall taste and structure of the bean and without introducing any toxic substance to the finished cup. All decaffeinated coffee will have residual caffeine of anywhere between 6-10mg in a 12oz cup. 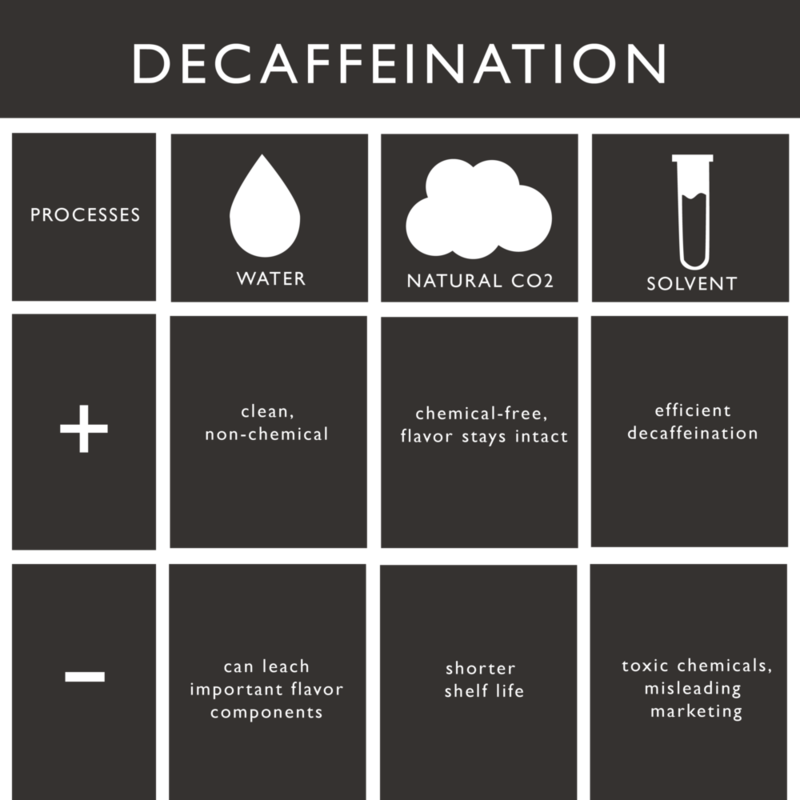 Decaffeination is regulated by the FDA in the United States where a minimum of 97% reduction of caffeine is required to be considered decaffeinated. Caffeine is water-soluble. In the water process, green (unroasted) coffee is soaked in a water-based solution for a period to extract the caffeine. The resulting liquid contains the caffeine as well as other water-soluble extracts important to the overall chemistry and flavor of coffee. This liquid is then filtered to selectively remove the caffeine, while maintaining much of the important flavor components. After filtration the decaffeinated liquid is reintroduced back to the coffee. (-) can leach important flavor components from the coffee. This is a natural process that takes advantage of a technology known as “Supercritical Fluid Extraction” (SFE). Extremely simplified, green caffeinated coffee is placed in a compression chamber and injected with liquid CO2 which specifically targets the alkaloid structure of the caffeine and absorbs it. Later as the pressure is released the CO2 returns to its gaseous state and is released through filters that remove the caffeine. The caffeine-free liquid is then returned to the coffee with almost all the essential organic compounds of caffeinated coffee without the caffeine. The solvent method uses chemical solvents such as dichloromethane or ethyl acetate to target and remove caffeine. The coffee is soaked in hot water for an extended time. The beans are then removed as the solution itself contains the caffeine and other flavor elements of the bean. At this time the ethyl acetate or dichloromethane is used to separate the caffeine in the solution, which is then filtered out and the resulting decaffeinated solution is added back to the green coffee beans. This is an extremely simplified description. Be aware that the solvent method can be “direct”, meaning the liquid is decaffeinated while in contact with the beans or “indirect” as described above where the beans are removed prior to decaffeination. The chemicals used in the solvent method are deemed mildly toxic by the USFDA and the resulting coffee is controlled and tested. Coffee decaffeinated with ethyl acetate are often referred to as “natural decaffeinated” and coffee decaffeinated using the solvent method are often referred to as “water process” decaffeinated coffee. In both cases the labels can be misleading making you think the process did not involve the chemicals used. You can and should expect your coffee roaster to know the exact method that was used in decaffeinating their coffee. Certified organic coffees may only use the water process or the CO2 process. Kona Coffee & Tea Company partners with a local Big Island company that uses the all- Natural CO2 Process to decaffeinate your coffee.